This year we read the Baptism text from Mark. While Matthew and Luke report what they have been told of Jesus’ birth, Mark’s shorter Gospel simply assumes such information. Mark’s proclamation begins with a statement of God’s authorization of John’s preparatory ministry. That authorization is set out in two prophetic oracles, Malachi 3:1 (“I am sending my messenger to prepare the way before me”) and Isaiah 40:3 (“A voice cries out: ‘In the wilderness prepare the way of the Lord'”). John’s ministry of preparation calls people to repentance, baptism, confession and forgiveness – the elements of our own preparation for encountering the living God. There is no other way than this “repentance road” on which the King is able to enter the hearts of his people. Confession and forgiveness remove the barriers that obstruct the King’s embrace of love. To baptize, (Greek, baptizo) literally means “to dip in” or “immerse,” implying also “to wash clean.” John invites the people of Israel to be cleansed from sin by repentance, turning away from old ways and moving in the opposite direction. Jesus’ arrival at John’s place of ministry signals the beginning of his own ministry. As the people seek God, Jesus joins them in an act of complete indentification. He goes down into the Jordan with these admitted sinners and submits to the same baptism. Though he has no need for repentance or forgiveness, the first step in his mission of atonement (2 Corinthians 5:21) involves the decision to associate himself fully with the human condition (Matthew 3:15). This act leads first to affirmation of God; it expresses perfectly Jesus’ identity as God’s Son. It also leads to a time of severe testing, the narrow, spiritual pathway that continues the repentance road. The words of calling and anointing for ministry heard in connection with Jesus’ baptism are the words that frame the church’s understanding of the ministry of all the baptized today: “You are my . . . Beloved; with you I am well pleased.” The radical nature of our calling is to bring justice and to serve the cause of the right, to be part of God’s own mission of liberating the suffering, the oppressed and the hungry. Using your own words, list in order those steps that must be taken to meet with the Lord. Name and agree with God about one attitude or behavior that needs to be changed in you. Go through the steps you have just outlined. Do you think John consciously associates himself with the prophets who came before him? Why or why not? What other messages might John wish to communicate through his lifestyle? What does John’s lifestyle suggest about his freedom from the values or opinions around him? What differences and similarities do you see between John’s water baptism and Jesus’ Holy Spirit baptism? Read John 3:1-8. How does Jesus’ conversation with Nicodemus further explain the two baptisms? What does Jesus’ baptism reveal about the nature of his ministry? In what ways does Jesus’ baptism define his calling from God? What does our baptism reveal about our ministry and calling? 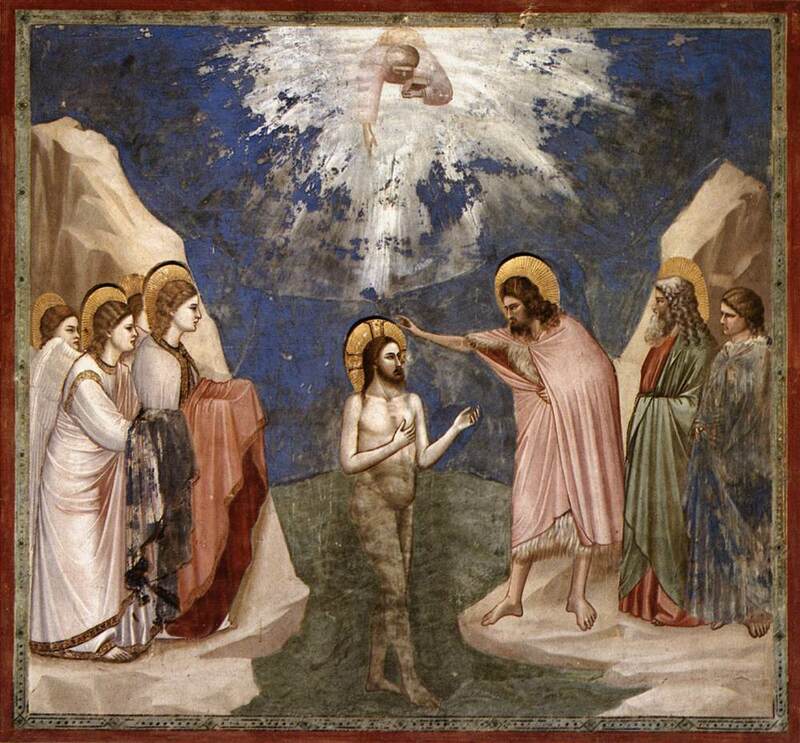 Image: Baptism of Christ, a fresco on plaster executed circa 1305 by the Italian painter Giotto de Bondone (c. 1267-1337) for the Scrovegni Chapel in Padua, Italy, where it can still be seen. This entry was posted in Baptism, Baptismal Covenant, Epiphany, Feast Days and tagged Baptism of Jesus, Jesus, John, Mark, Ministry, Repentance. Bookmark the permalink.